I hope you will enjoy this recipe – it’s fairly simple when it comes to the ingredients. Let me know how yours turned out in the comments section below! Chop the onion and washed mushrooms and fry these shortly in a little oil until the onion begins to soften die Zwiebel glasig wird. For the low calorie option add the balls to an ovenproof dish and bake at 200 degrees Celsius for about 20 minutes. Alternatively heat a little oil in your pan and fry the ‘meatballs’ in your pan. I would advise using a pan with lid for this, as the oil can splash during the frying period. 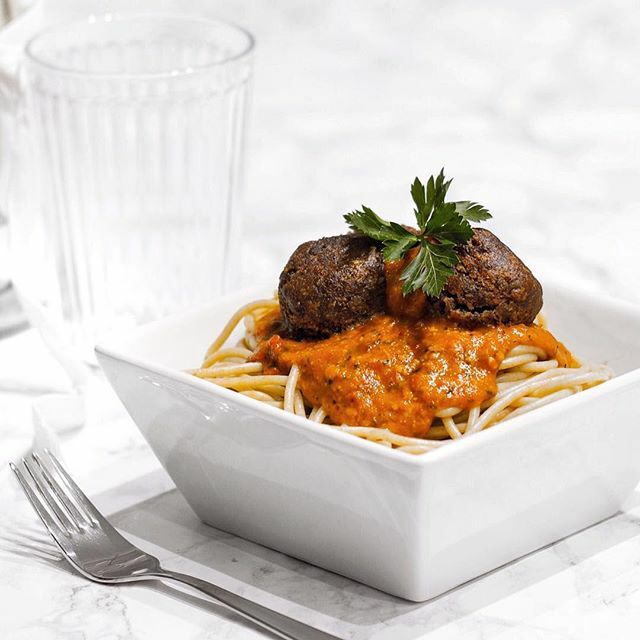 These ‘meatballs’ are great on a sandwich but also amazingly paired with Spaghetti & tomato sauce – like I did in the image above. But most importantly: enjoy! Need more recipe inspiration? Simply follow me on Instagram where I regularly post new recipes on my feed and Instastory!